"Author Nancy Louise Lewis delivers a cutting-edge confessional, a meditation on land and personhood, genealogy and memory, that vibrates with longing and overcoming through tight form and haunting evocation. The poems in Girl Flying Kite range from idiomatic, cultural expressions (to rival Penn Warren and Frank Stanford) to quiet, breath-like paeans and dirges for the intimacies of childhood. Ms. Lewis has a clear and cogent vision that she manages to articulate through ghostly colors and raw particularities in an enviable collage of a life both troubled and brilliant— a paramount expression of the poet’s soul: and the soul of all who have survived the mysteries, dichotomies, and beauty of this world. 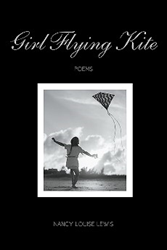 'Girl Flying Kite' is a must read for all enthusiasts of contemporary poetry," states PBK Reviewer M. Dixon. About the Author: Now retired, award-winning newspaper journalist and college professor Nancy Louise Lewis was born near Appalachia and now resides in Connecticut. She is CEO of her nonprofit, Legalities, Inc., which helps deserving litigants afford an attorney to access the court system. This is her second book. Her first was her memoir "Daisies Don’t Lie: Misadventures in Journalism: The Making of a Feminist." “This unique poetry by Nancy Louise Lewis offers a kaleidoscope of powerful themes that will capture the imagination. Strategic is thrilled to announce its release,” said Robert Fletcher, CEO of Strategic Book Publishing and Rights Agency. http://sbprabooks.com/NancyLouiseLewis or at Amazon.com or Barnesandnoble.com.